History of the “five mile” fallacy. At some point in the development of The Empire Strikes Back it was decided that Lord Vader would have a distinctive flagship representing an elite class. At first it was thought that Executor would be another kind of destroyer, with advanced engine systems making it an exceptionally fast vessel. Instead, later concepts were upgraded to a battleship scale, so that impressive size, not speed, became the emphasis. Unfortunately, some (but by no means all) of the later spin-off literature overlooked the size upgrade, retaining the obselete and incorrect “destroyer” label. The Empire Strikes Back Official Poster Monthly of 1980 makes a loose statement regarding the size of the Executor. Strictly and logically, this statement only states that the Executor is larger than an ISD, and that it is more than five times as powerful. It does not specify the length as being exactly five times the length of the ISD, only that it is greater than the ISD. Later references based on this source seem to have taken a wilder interpretation than what is logically justifiable. There are two theories about the origins of the ambiguous statement above. The first is that the “five” actually refers to the number of star destroyers attending the Executor in Lord Vader's taskforce. The second theory is that one of the earlier design concepts for the Executor really was five miles long, and somehow this old data was misapplied to the larger, final version. At one stage, Kenner considered including an item based on the Executor in their toy line. The developers considered the ship's true name too scary for children, so they invented the “super star destroyer” label. This term is insensitive to realistic naval terminology, unlike the more intelligent “battlecruiser” and “battleship” designations used in Williamson's STAR WARS newspaper comic strip. Return of the Jedi includes the Executor in many shots, and the scaling relative to other vessels is consistent with The Empire Strikes Back . It is approximately eleven times the length of a star destroyer. Executor is repeatedly referred to as a “commandship” or “command ship”, not a destroyer. The only exception is one utterance of “super star destroyer” by Admiral Ackbar, but this is excuseable because: Ackbar was not speaking in his native tongue; he probably only knows the rebel slang name for such ships; he was speaking in the heat of battle; and his line was a late and hasty addition to the movie anyhow (it missed inclusion in the novel). Also note that this is the first time that “super star destroyer” is treated as if it were a formal classification, rather than a colloquialism. This myth grew in parallel with the length error. Note that the writer has jumped to the conclusion that the naval designation of this class of vessels is “Super-class”. This defies maritime convention. The proper classname is based on the name of the first ship built according to the design. That being the Executor in this case, the designation should actually be Executor-class. A correction was later made in the novel Shield of Lies , but the notion that the Executor is a destroyer, rather than a battleship or commandship, persists unfortunately. Except for the Death Star battle station, the Super-class Star Destroyer is the largest warship ever constructed. Five times the length of an Imperial Star Destroyer ... over 1000 turbolaser batteries, ion cannons, and tractor beam emplacements dot the eight kilometre length ... Four of these massive vessels are now in service. The first of the Super Star Destroyers, the Executor, was built for Lord Darth Vader as his personal flagship. More than four times the length of a standard Star Destroyer, the colossal Executor was the largest vessel in space, with the sole exception of the Death Star itself. On the surface, this looks like an even worse figure than the mistake which was unwittingly promulgated by West End Games, however on inspection it reduces to the simple statement that the Executor is something greater than four times the ISD length, which allows “eleven times” just as well as it allows “five times”. The author was probably aware of the serious error in other recent sources but for one reason or another felt censoriously constrained. On other matters, such as the positioning of TIE Fighter cockpit hatches and the deck plans of the Millennium Falcon he was unafraid to cite the films as primary evidence, overturning errors in second-generation materials. 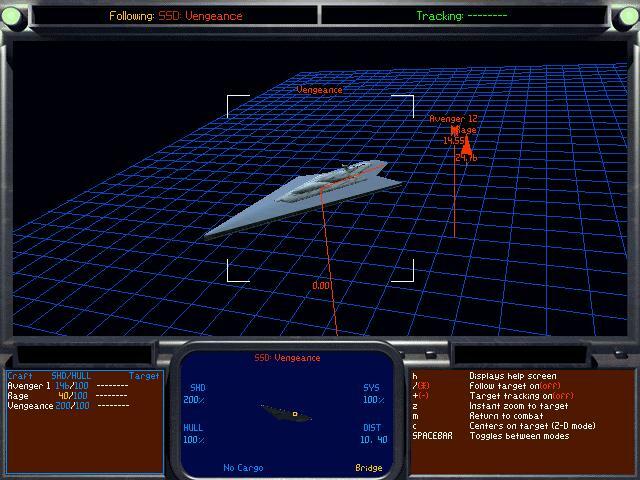 Meanwhile the LucasArts Entertainment Company, itself a division of Lucasfilm, has used “super star destroyers” in some of its computer game products. Images of these giant vessels in scenes of TIE Fighter are correctly proportioned, unlike the WEG diagrams. 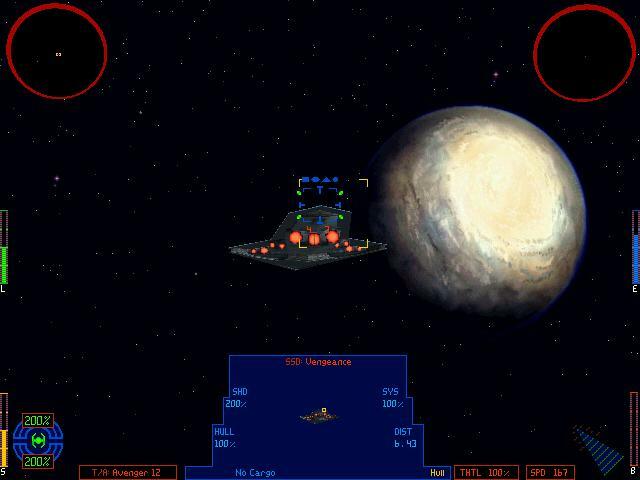 Dark Forces and Rebel Assault II are faithful to the larger length portrayed in the STAR WARS films and directly defy the error propagated by West End Games. Note, however that some illustrations printed in SWRPG products depict Executor-class ships with accurate dimensions relative to ISDs. The image of the Guardian in Wanted by Cracken (1993) is an excellent example of this. At the grassroots level, discussion of the problem of the Executor length has run spasmodically for several years on InterNet newsgroups. With the advantage of modern videotape capabilities, many individual STAR WARS devotees have independently discovered the “five mile” fallacy. When the conception of Essential Guide to Vehicles and Vessels became known to the world, early in 1995, I constructed the first version of this web page for the purpose of bringing the error to wider public notice and to improve the chance that the first edition of the then-impending book would contain a truthful Executor length. Since that time some progress has been made in the official literature. Shadows of the Empire , arguably the most ambitious and significant STAR WARS novel to date, has refrained from quoting the “five mile” figure, which seemed almost obligatory for every earlier novel which contained an Executor-class commandship. The STAR WARS Customizable Card Game 's newly-released card depicting the Executor renounces the old error in a cautious way, admitting that the flagship is “over eight kilometres long”. Executor, larger and more awesome than the five Imperial Star Destroyers that surround it, sits in the vastness of space. The essential idea is this: The Executor had five ISD escorts immediately before the Battle of Hoth. The Executor was larger and more powerful than all of them. The specification of a five-mile length is simply a historical distortion. A new novel, X-Wing: The Bacta War indicates that the standard mile-long star destroyer is less than one tenth of the size of the Executor-class command ship Lusankya. This is compatible with the correct relative dimensions of the ships. Refer to p.302 of that publication. The section is quoted in the Novel References pages. After seventeen years, AMT/ERTL planned to release a model kit of the Executor. The model has been assigned a catalogue number of #6351 and was originally due out in August 1997. It seems to have been cancelled, at least for the moment. If it is ever produced, it shall be interesting to see whether this kit depicts the thirteen-engine, eleven-mile vessel seen in the films, or else the contradictory, distorted, nine-engine, five-mile figment detailed in roleplaying game sources. 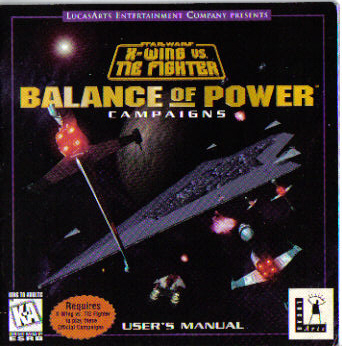 An upgrade to LucasArts' X-Wing vs TIE Fighter commputer game, set before the Battle of Endor, entitled Balance of Power , includes a “Super Star Destroyer” as a target. This ship is called Vengeance (making it at least the third vessel with that name). It is commanded by Admiral Senn, and it is stationed in Airam sector. It matches neither the Executor's features exactly, nor the mythical five-mile ship from WEG . 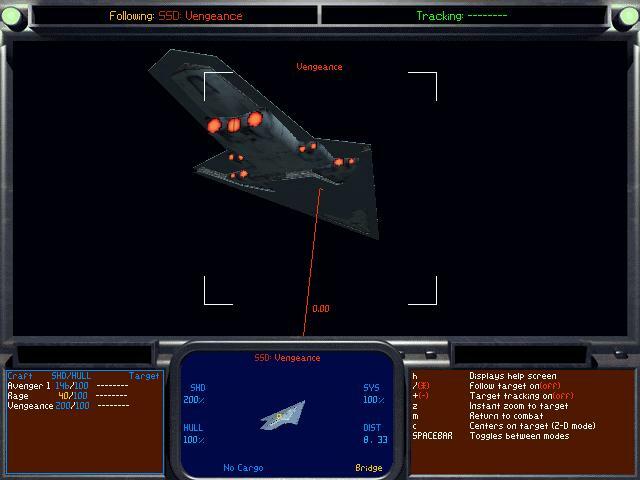 The shape resembles the Executor better than the RPG figment, but the statistics displayed within the game indicate the usual erroneous 8km length. [ Refer to this screenshot]. There is one significant detail of difference from the Executor shape: there are only eleven thrusters; the two wing engine banks are reduced from three to two cylinders each. Interestingly, the art on the game's package indicates what seems to be the proper eleven-mile size. This is ilustrated in the game manual and box cover. According to N.Gellock, the Vengeance appears to be at least as long as eight destroyers in the box art. Archeologist and Lucasfilm employee Dr David West Reynolds has taken measurements of the original Executor model in the Lucasfilm Archives. He took the measurements on my personal request, for use in this site. Scaling according to the constant command tower, the total length is calculated to lie between 17.4km and 17.8km. The most likely definitive value for the Executor length is 17.6km. The Executor is over eight times the size of an Imperial-class Star Destroyer. This is still only a lower limit, but it is much better than the one used by Decipher 's card game. Assuming that “size” means length, the web site is stating that the Executor is longer than 12.9km. The multimedia CD-ROM product Behind the Magic contains a few statements about the Executor. In some parts it states a length of eight kilometres; elsewhere it says 12.8km. The reference book Inside the Worlds of Star Wars: Trilogy by James Luceno corrects the record of the Executor's length: nearly a dozen times the length of a star destroyer. In other words, it is at least 11 miles long, but not quite 12 miles. All newer sources should include the corrected length. 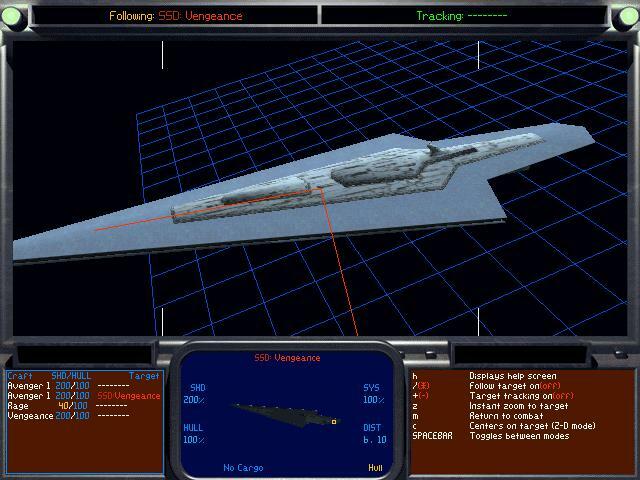 Furthermore, “super star destroyer” is confirmed as rebel slang for warships larger than a common star destroyer, including star cruisers and star dreadnoughts. The Executor-class is an example of a star dreadnought, the top-line battleships of their day. Several new publications state a length of 19km for the Executor: near the upper end of the 11 – 12 mile range. A “databank” at the Official SW Site is updated to the same figure. 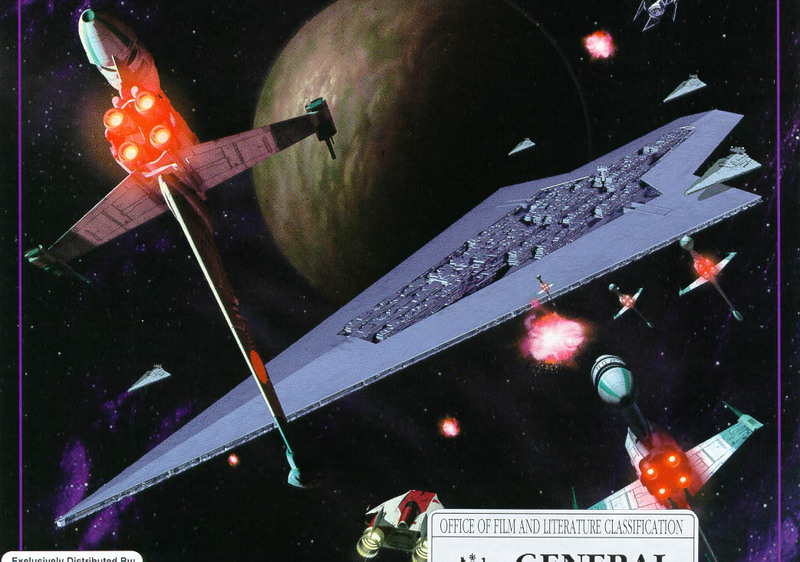 The distorted “Super Star Destroyer” drawing from The Imperial Sourcebook . Note the absence of the main ventral docking cavity, the misplacement and oversizing of the command tower, and the reduction from three engine banks to just one (or debatably two). This elegant image of the damaged Guardian, from Wanted by Cracken is important as an example of an image in the roleplaying game reference which has somehow been allowed to depict the command ship and star destroyers in realistic proportions. Daniel Bonilla for information about Behind the Magic . Geoffrey Dalton for scanning the Balance of Power manual cover. Niel Gellock for reporting on ship dimensions on the Balance of Power package. Jeff Gaboury for speculation on the 1980 “five times” figure. Martyn Griffiths for the tale of Kenner's abortive first-generation Executor toy. Jan-Tore Hammer? for notice about the updated “databank”. Jeremy Helper for advice relating to the Vengeance in Balance of Power , and for a set of valuable screenshots. Andrew Leonard for my first and most detailed news about Balance of Power . Dorian Kratsas for the history of the “Super-class” name as a budgetary subterfuge. Eric Meadows for advice regarding the engines of Vengeance in Balance of Power ; for further screenshots. Ethan Platten for reporting on ship dimensions on the Balance of Power package. Wayne Poe for notice about the updated “databank”. Anthony Tully for a detailed account of the earliest periods of the growth and propagation of the five-mile fallacy. David West Reynolds for measuring the Executor and sending me his data. Michael Wong for information about Behind the Magic . ⇒ STAR WARS Technical Commentaries. Original content is © copyright Dr Curtis Saxton 2005, except for images which are copyright Lucasfilm Ltd, used here under Fair Useage terms of copyright law. Last updated on 28 October 2006.